Join the Center for Leadership & Social Change for good food and great conversation! The Center is hosting the first commUNITY Dialogue of the semester on Friday, October 9 from 12:00 – 1:30pm in the Dunlap Student Success Center. Open to students, faculty, staff, and community members, the event will feature lunch, a presentation, and time for group dialogue. 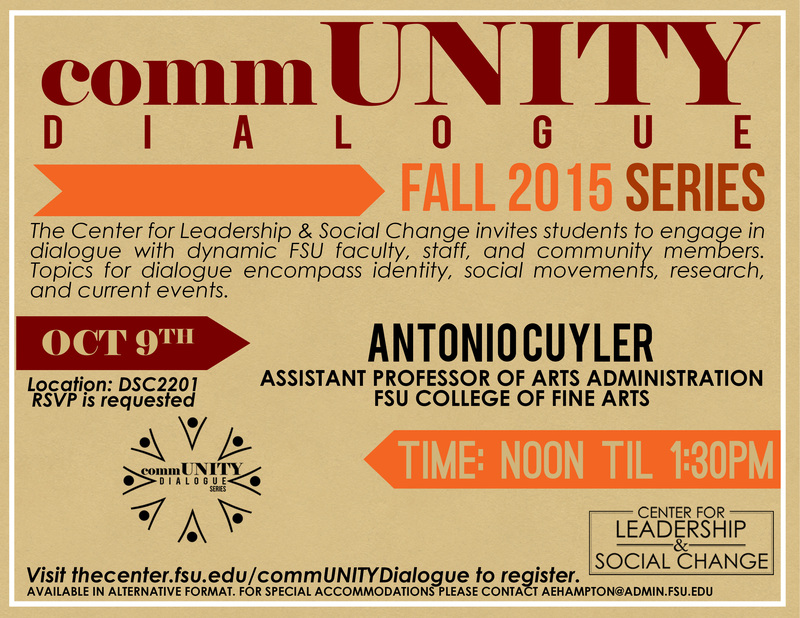 Our speaker is Dr. Antonio Cuyler, an Assistant Professor of Arts Administration at FSU. His talk is titled Access, equity, and inclusion: Building bridges through advocacy & leadership in public funding in the cultural sector. This session will explore inequity in cultural public funding in San Francisco to identify lessons learned and advocacy strategies for rectifying cases of inequity in public funding within the cultural sector. You can RSVP here: https://fsu.qualtrics.com/SE/?SID=SV_cYowQMjZESEsV0h. We hope to see you there!